Emerald Downs is a thoroughbred racetrack in Auburn, Washington, located a half mile east of Highway 167. 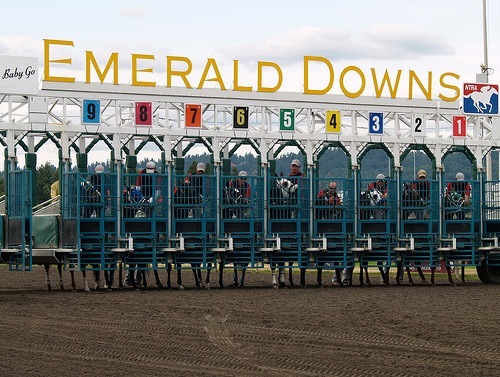 Emerald Downs first opened its to doors to race fans on June 20, 1996. It replaced Longacres Racetrack, which closed in September 1992 after sixty seasons of racing. Emerald Downs is a Limited Partnership, with a group of investors led by Track President Ron Crockett. The Emerald Downs track is a one mile oval in the shadow of Mount Rainier. The track surface itself is made of geo-textile fabric, washed rock, course sand, and one-component track material. However, there is no turf course. The tote board is located in the center of the oval track. The infield is used as drainage for local wetlands and is often flooded in the beginning of the season creating a home for ducks, geese, rabbits, and other small wildlife. The Emerald Downs Grandstand is a modern racetrack facility. There is general admission seating on track level, including a grassy park area with free children's activities on weekends (weather permitting). Outside on the third floor are box and reserved seats in the grandstand, as well as box and reserved seats on the fifth floor indoor clubhouse. Pari-mutuel windows are located on each floor to place wagers. There are eight food stands and six beverage services throughout the facility. There is also the Rainer Restaurant on the fifth floor, with reservations generally accepted two weeks in advance. The state-of-the-art facility and in-house catering at Emerald Downs lends itself to hosting a variety of events year-round. The Triple Crown Suites on the 6th floor and the large banquet space on the 4th floor are just a couple of venues available for group events. Each barn is a complete facility for horsemen with: 116 stalls; 22 tack and feed storage areas; six trainer offices; 12 hay and straw storage areas; 10 wash racks; 13 dorm rooms for grooms and six mechanical hot walkers. Each stall is 10 feet by 12 feet in size. For the horse's protection, each stall is padded with plywood wainscot kick-boards. The Morris J. Alhadeff Sales Pavilion is the home for the Washington Thoroughbred Breeders Association. The $1 million facility opened to the public on December 14, 1997, for the 1997 Winter Sale. It was funded by significant donations from Micheal and Kenneth Alhadeff and other industry members. The entire structure – including the sales arena and 4,400 square feet of office space – is 17,300 square feet. The Morris J. Alhadeff Equine Hospital is a state-of-the-art facility used by the Emerald Downs Veterinary Association. The vet clinic has all the equipment necessary for a full gamut of procedures. The track hosts Live Thoroughbred racing from mid April through the end of September. Races are run Friday through Sunday from opening to Memorial Day. Four-day race weeks begin Memorial Day weekend (Fri-Mon) and stay Thursday through Sunday to the end of the season. The track conducts several large ungraded stakes and many overnight handicaps and stakes. There are an average of 8 races on week nights, and 10 races per race weekend. In addition to live racing, the track offers simulcast wagering year round. Gallyn Mitchell is the all-time leading rider at Emerald Downs through the 2008 racing season and the only jockey to have raced at every meet since Emerald Downs opened in 1996. Jennifer Whitaker is the all-time leading female rider. Ricky Frazier set records for wins in a season (157) and earnings ($1,632,102) in 2007. Frazier won the riding title again in 2009 with 155 victories and $1,492,455 in earnings. The track record for wins in a single day is six, shared by Seth Martinez (July 27, 2008) and Kevin Radke (September 2, 2002). Many famous jockeys have ridden at Emerald Downs, including several members of the Thoroughbred Racing Hall of Fame. Laffit Pincay Jr., Pat Day, Eddie Delahoussaye, , Gary Stevens, Alex Solis, Garrett Gomez, David Flores, Robby Albarado and Gary Baze have all competed on the Emerald Downs oval. Tim McCanna is the all-time leading trainer at Emerald Downs through 2008 and has won 8 of the 13 training titles since the inaugural season of 1996. He is also tops in career earnings ($5,895,642) and ranks fourth in stakes victories (27). McCanna won a track record 66 wins in 2008. Washington Hall of Fame Trainer Jim Penney remains one of the most accomplished trainers in state history. His five career wins in the Longacres Mile (three at Emerald Downs) ranks best of all time. He is also the only trainer in Washington State history to win five races in a single day twice. Doris Harwood is the only other trainer to accomplish the feat a single time, collecting five wins on August 8, 2009. Penney's 33 career stakes wins rank third all-time and he also earned a training title at Emerald Downs in 1998 when he led all conditioners with 46 wins. Wasserman is the track's all-time leading earner, with $422,412 in purses won entering the 2009 racing season. Market Master and Bob Stories are tied for most career wins at Emerald Downs with 16, with Handy N Bold leading in career stakes victories with 10. In 2005, Halonator set the track record for wins in a season with 8. Emerald Downs biggest race is the Longacres Mile Handicap, a Grade III event. The race was announced in June 1935 so Longacres founder Joe Gottstein could have a signature one mile race. He felt the mile was an overlooked distance, neither a sprint nor an endurance run. In order to attract racers and attention, the purse was set at $10,000, instantly the largest staked one mile race in the country (and it would remain so for more than 40 years). As soon as the announcement was made, the first running of the race had 20 entrants; 16 actually started. The stakes attracted the owners of a New Orleans horse named Biff, grandson of legendary Man o' War, who had just won $5000 in Chicago. Biff had the attention of everyone for weeks before the event and no owners would run their horses in preliminary races with him. Biff was first out of the gate but was stalked by Coldwater, a 20-1 longshot that wasn't regarded well. Near the end of the mile Biff was showing clear strain and Coldwater overtook him to win. In 2008, locally owned and bred Wasserman took the Longacres Mile closing fast to win in a photo finish over horses shipped in to run the race. The Longacres Mile is now a featured "Win and Your In" race into the Breeders' Cup, but the 2008 winner declined the invitation. The 2009 winner, Assessment, subsequently chipped a bone in his ankle during a workout and was ruled out of contention in the Dirt Mile.